Fred and Lily: They won the 2009 edition of the Noosa Festival of Surfing, and they run NALU Association. 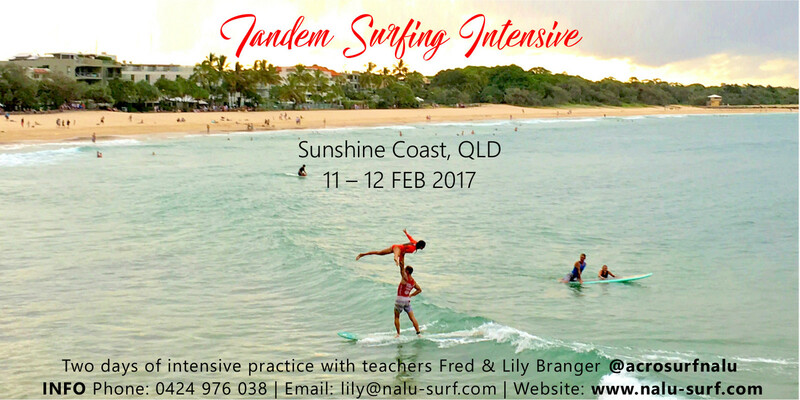 Together, they teach Tandem Surfing on different beaches of the Australian Sunshine Coast and Byron Bay. Fred is a registered Surfing Australia coach. 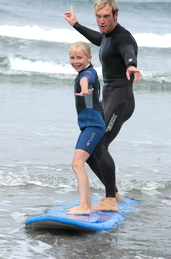 Whether you’re a girl or a guy, a kid or a grown up, there is a lot of fun to be had on a tandem surfboard. Those boards are pure fun to just cruise on and as you get more comfortable, you can start learning the lifts. If you’re a surfing couple and want to give it a shot, we’d be happy to give you a few pointers and lend you a board. If you’re a kid looking for a cool sport to get into, then look no further. Have your parents give me a call and I’ll give them a million good reason they should let you tandem surf. Just like many sports, it can get tough, but if you learn it right it is no more risky than gymnastics or ice skating. I would even argue it is safer, because you fall into water. I’ve been teaching surfing for 7 years and this past summer I taught a bunch of the girls at surf camp how to tandem surf. They all did great and had a blast. The youngest of these graceful daredevils is 8 years old and she can’t wait to find a steady partner to go tandem surfing with! You don’t really need to know how to surf, you don’t have to be a gymnast, a dancer or an ice skater, you don’t even need to be flexible or petite. Of course, any of the above helps but they are far from being requirements. What you will need however is will and determination. Just like surfing, this activity depends very much on how nice the waves are and it can sometimes get to be a little frustrating. Bumpy and flat days are great opportunities to stay on the beach and learn the lifts. As the female partner, your part is crucial to successfully complete each one of them. Using proper technique and coordination will make the lifts much easier on your partner. So, the more you practice, the better. Some of the lifts are really easy and require little balance and strength, others are much more challenging but don’t worry, the learning curve is steep. I won’t lie to you, your surfing skills are a bit more important. You don’t have to know how to throw tailslides and aerial 360’s but it helps a lot if you’re comfortable riding a big board. What you want to do at the beginning is focus on your wave selection. You want to pick waves with mellow take-offs and long open faces. It’s also very important that you always put the safety of your partner first. You want to make every effort to hold on to her at all times. That way you assure yourself that the board falls away from her and if it’s shallow, you can cushion the fall. Strength is somewhat important but good technique can make up for lack of the former. Plus, the more you do it, the stronger you get at it. In no time you’ll be able to cancel your gym membership! And believe me, tandem surfing is a lot more enjoyable and rewarding.